The doctors here at the Mendon Village Animal Hospital want to make sure you know what heartworm disease is and why we stress the importance of heartworm prevention all year round! Heartworms are transmitted by mosquitoes. One bite is all it takes for heartworm larvae to be transmitted into your pets blood stream. The larvae then migrate into the heart and the blood vessels of the lungs, where they set up shop and mature into adult heartworms. These adult heartworms restrict blood flow throughout the body. Adult heartworms can grow to up to one foot long. A dog who tests positive for heartworm disease can be infected by as many as several dozen worms at once. While some pets with heartworm disease will exhibit symptoms (shortness of breath, coughing, lethargy) many pets are asymptomatic! Why is it so important to protect against heartworm disease? It only takes one bite from an infected mosquito for your pet to get heartworm disease. Approximately 1 in 200 dogs test positive for heartworm disease every year. We had 5 positive heartworm tests here at MVAH in 2013. Heartworm disease is very expensive to treat. Most importantly, heartworm disease is FATAL if left untreated. 1. Test your dog for heartworm disease every year. We do this at your dog’s annual preventive care exam as part of what we commonly refer to as a “Heartworm/Lyme test”. A small blood sample and 8 minutes is all it takes for peace of mind that your dog is heartworm free. 2. Give heartworm preventative every month. We use a product called Sentinel once a month on a year round basis to protect our dogs. Sentinel is a flavored tablet that can prevent heartworm, treats for intestinal parasites, and helps protect against fleas. For cats, we use Revolution. This topical medication is applied once a month. In addition to helping prevent heartworm, Revolution treats for intestinal parasites and helps protect against fleas and ear mites. 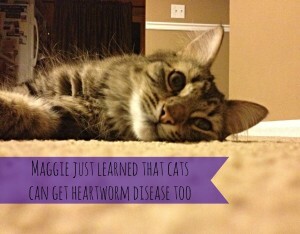 So cats can get heartworm disease, too? Yes! Heartworm disease in cats is more difficult to diagnose. Cats are often asymptomatic, but may show respiratory symptoms which are often mistaken for asthma. We’ll leave you with this video from the American Heartworm Society, which stresses the importance of year round heartworm prevention. As always, contact us if you have any questions!